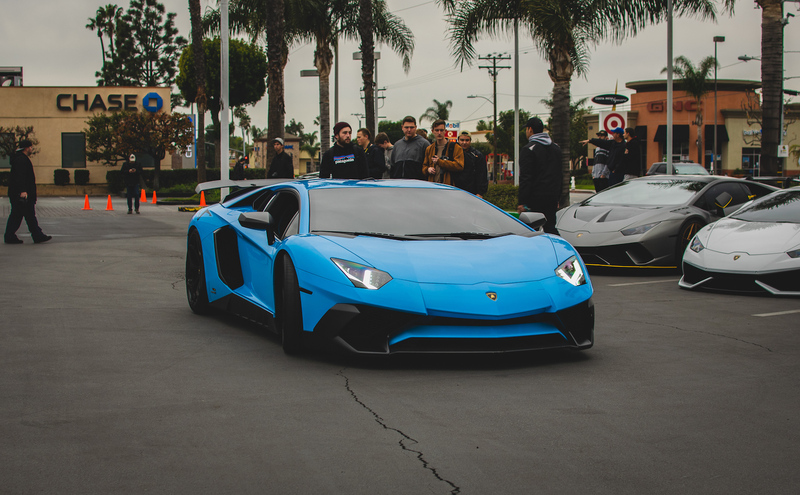 On the first Saturday morning of every month, Baker Street in Costa Mesa, California echoes with the sounds of V-8s, V-10s, and V-12s as supercar owners patiently line up to enter the hallowed gates of the Lamborghini Newport Beach parking lot. 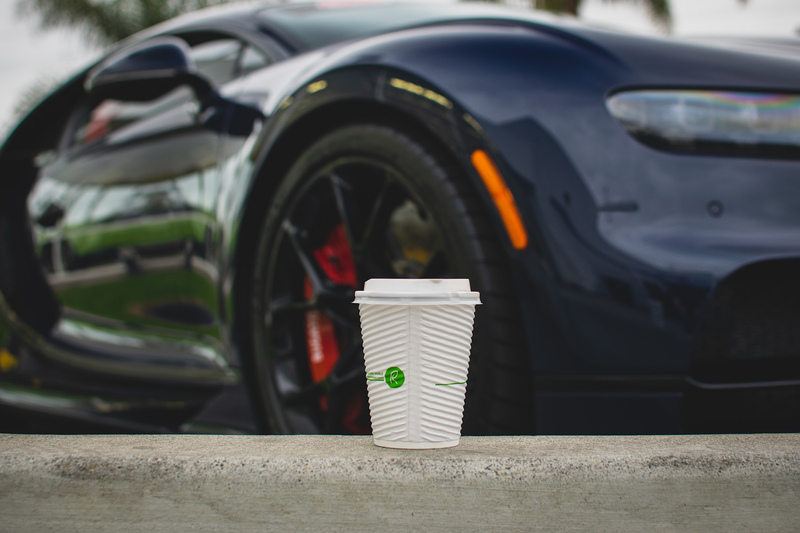 This tradition is part of the Lamborghini/McLaren/Pagani/Koenigsegg dealership's monthly Cars & Coffee event, and it's a must-visit for any local hypercar connoisseur. 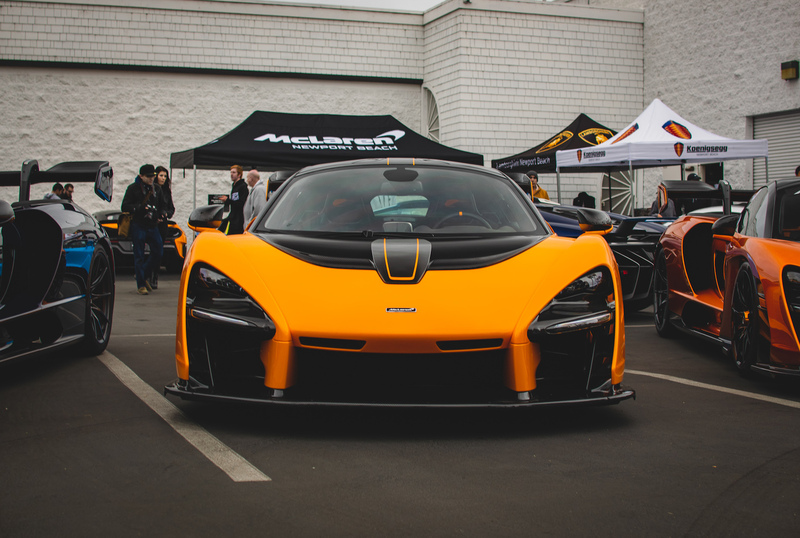 Although Lambo Newport Beach has been putting on its C&C since 2013, it caught my and other car spotters' attention last year when it received the first McLaren Senna on the West Coast, a brilliant Papaya Orange example that became the star of the April show. 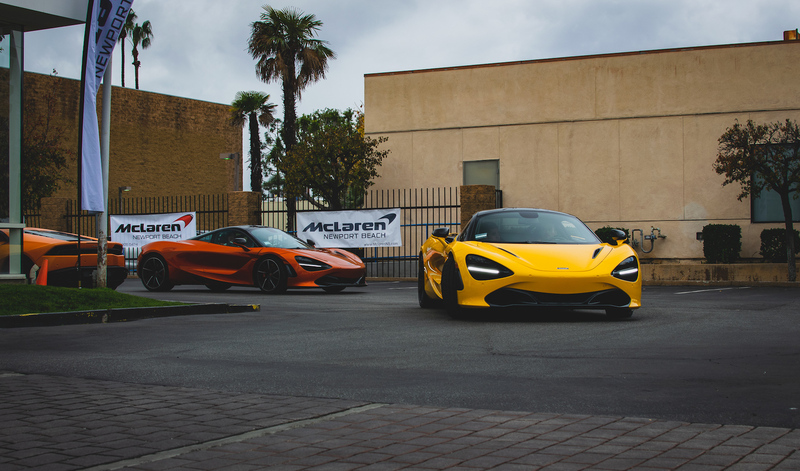 To top that, Orange County's hypercar dealership conglomerate invited seven Sennas to the first Cars & Coffee event of the year, making for one spectacular meet. 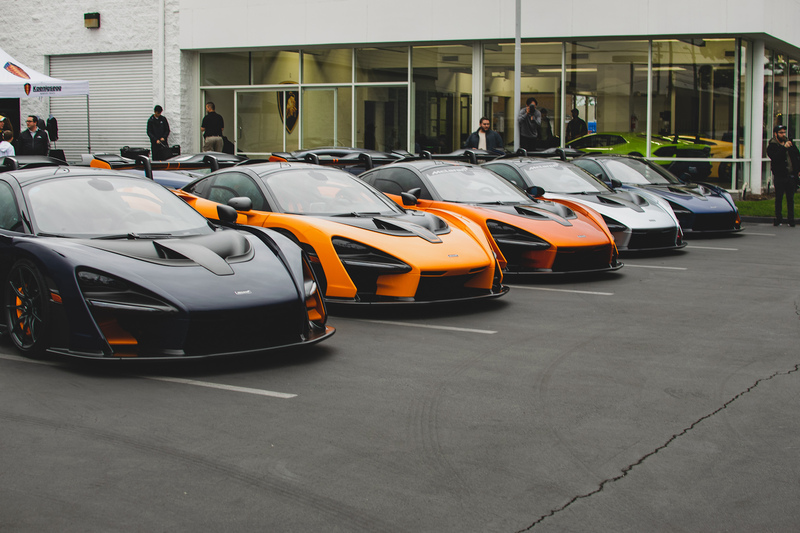 Controversy has surrounded the Senna's looks since it debuted, but having the chance to see not just one, but seven of them in person and in multiple specifications is sure to change some minds. 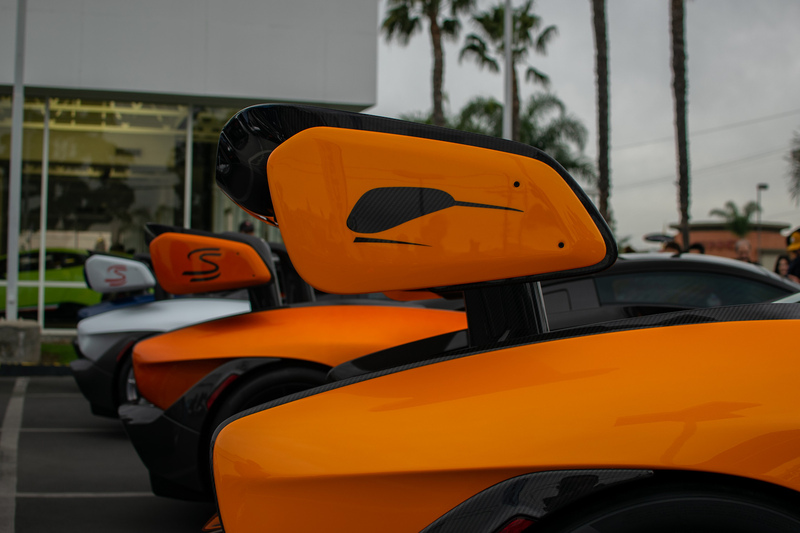 The dedication for those who showed up earlier than the 9 a.m. start time and braved rare SoCal drizzle paid off immediately, as Lambo Newport Beach lined up five of the seven McLaren hypercars early in the morning, taking up nearly a full row of the lot. 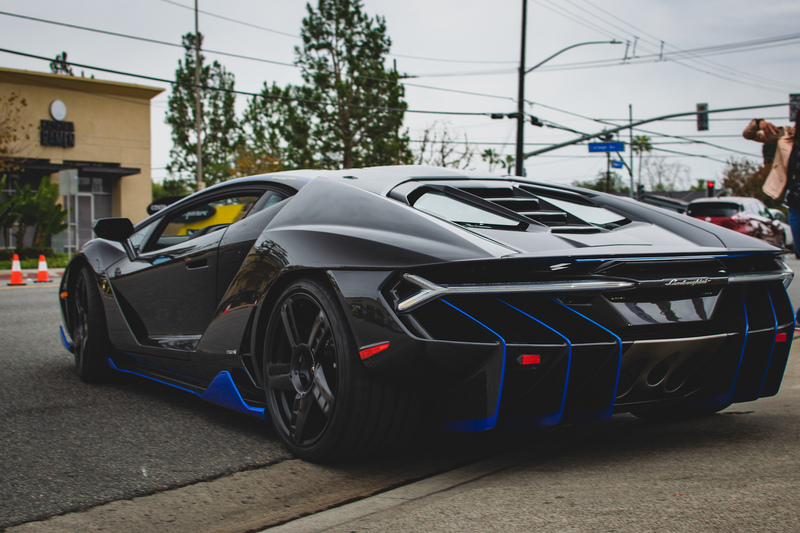 The sixth Senna was wheeled out from the bowels of the dealership's workshop later on, and the final Senna, a carbon fiber example with blue accents recently purchased by big-time collector Dan Kang, rolled into the meet with his matching Lamborghini Centenario. 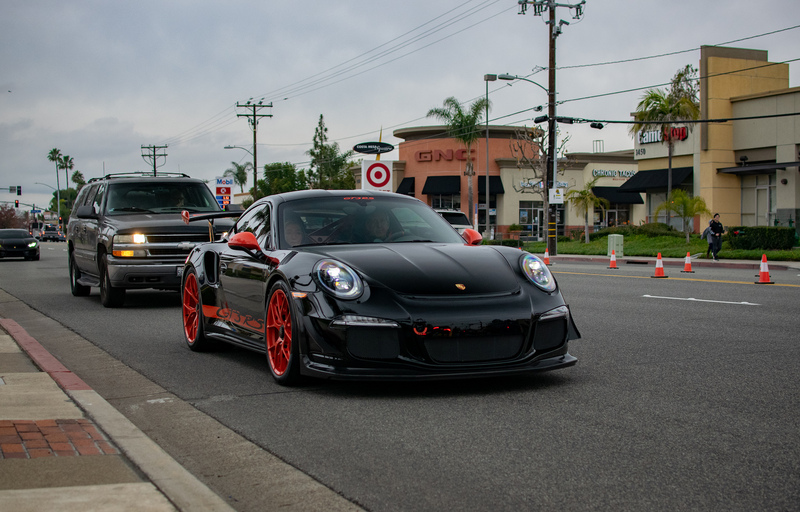 Everyone wanted a unique angle of the F12tdf, so I chose through the wing of a 911 GT3 RS. 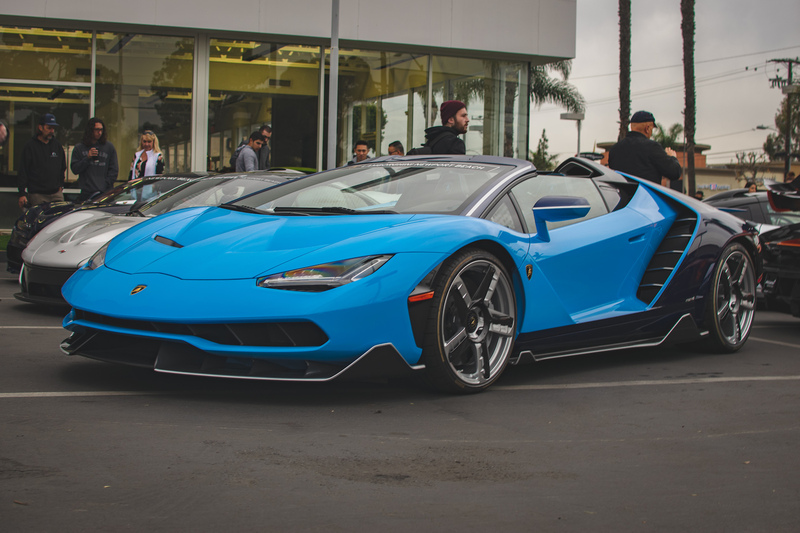 It wouldn't be a hypercar show without a lineup of other high-priced performance cars, and the seven deadly Sennas competed for the spotlight with two Bugatti Chirons, a McLaren P1, and the dealership's personal two-tone blue Lamborghini Centenario Roadster. 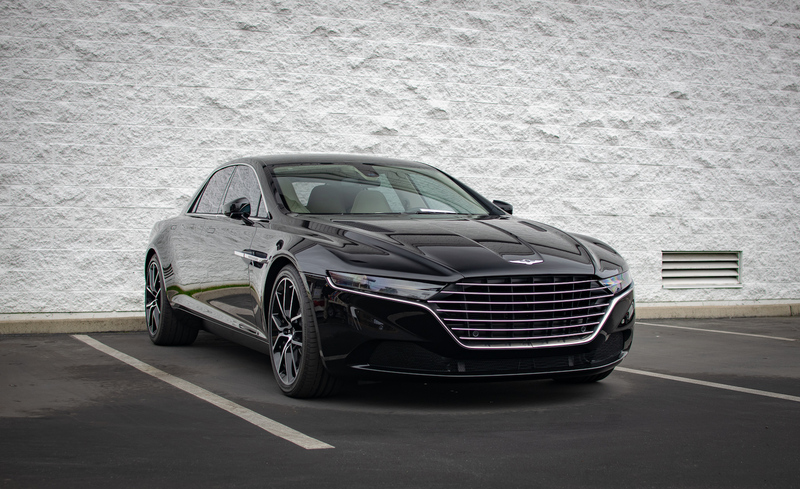 Those with a sharper eye could immediately recognize two rare beasts tucked away in opposite corners of the dealership's grounds: an Aston Martin Lagonda Taraf, Aston's seven-figure super sedan, and a Ferrari F12tdf, the most exclusive grand touring car Maranello currently offers. 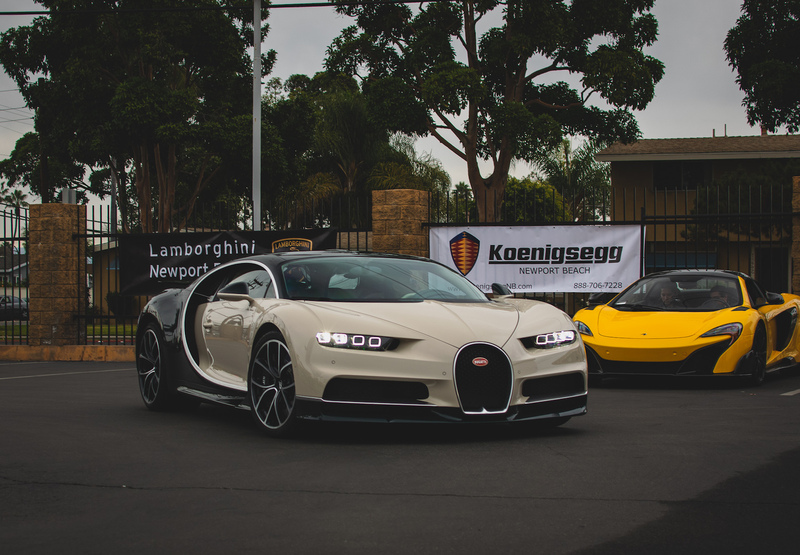 Inside the dealership, a Lamborghini Gallardo Squadra Corse shifted attention away from the collection of brand new Huracan Performante Spyders on the showroom floor. "Gruppe B" was the original name of the 959. 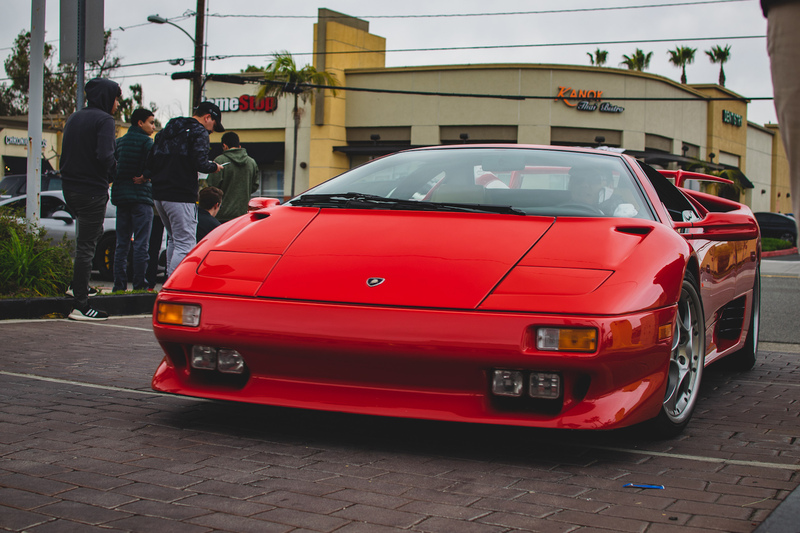 Old outclassed new as some of the most iconic supercars of the late 1980s and '90s arrived to reclaim their glory, with a matching red Lamborghini Diablo and Countach 25th Anniversary Edition showing up to challenge the well-represented group of contemporary Lambos at the show. 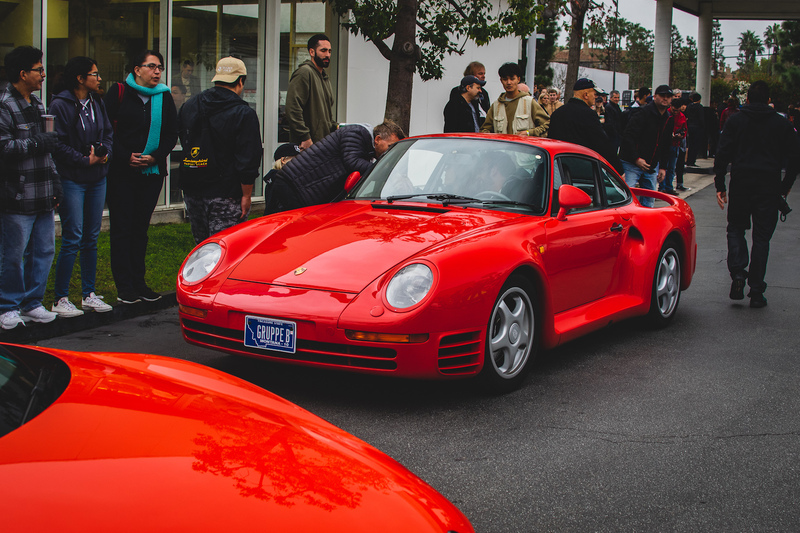 A Porsche 959, also red, took center stage. 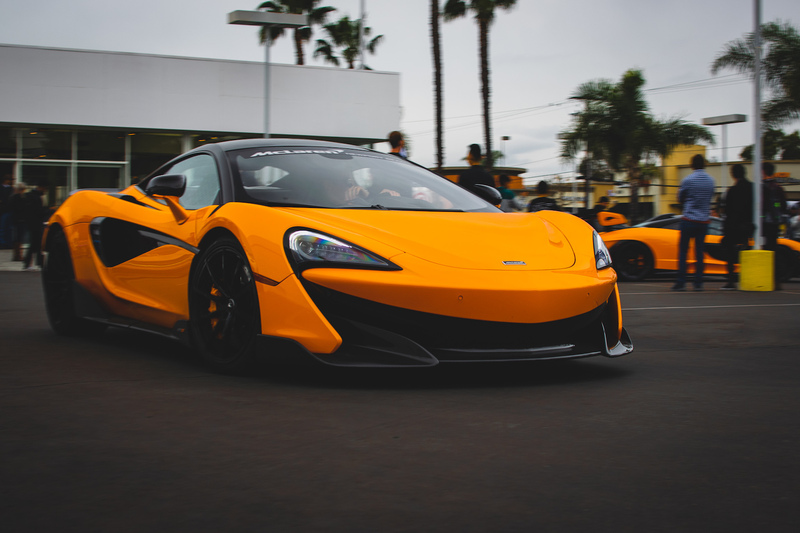 We're not even a month into 2019 and this car show has already proved it's one of the best, at least on the West Coast. 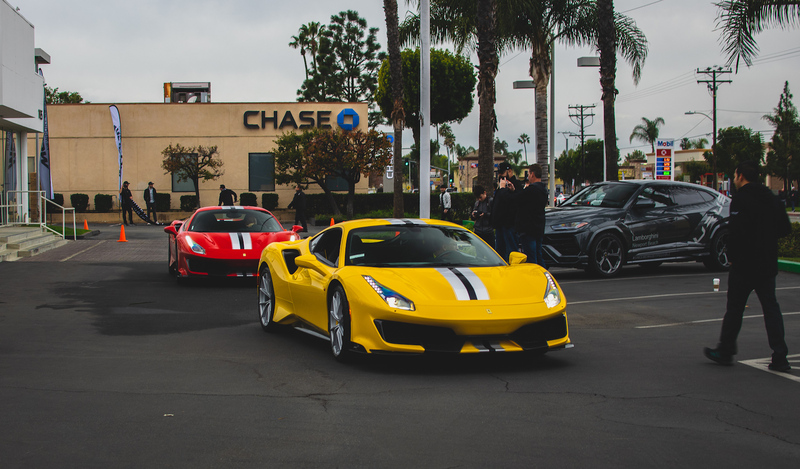 If you can't make it to Monterey Car Week this year, this much more frequent and much cheaper (a.k.a. 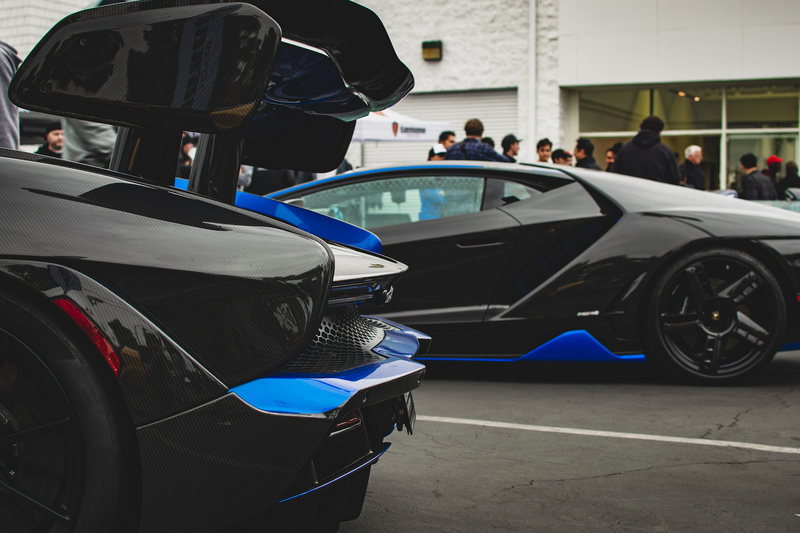 free) hypercar show isn't a bad alternative.